Allen Boyle and his beautiful bride of 45 years have four grown children and 13 grandchildren. He now lives in Southern California with his wife and two dogs, an AKC Champion Australian Cattle Dog named Tank and a miniature short-haired dachshund named Gretel (not a champion but she is a sweet little girl). Allen practices teaching Bible lessons to Gretel, who sits patiently but with questionable comprehension! This teacher’s alma mater is Dallas Bible College where he studied Bible following his eight years of service in the military. Now a retired elder, he holds a Masters-level DCS degree from Tyndale Theological Seminary. Mr. Boyle is currently finishing His Doctor of Ministries Degree (D. Min.) while he continues to write and teach adult Bible Studies. Allen is an accomplished writer, classroom and seminar teacher. He has taught throughout the Continental United States, Alaska, Hawaii, and Canada. Allen’s goal through his Bible studies, devotions, and treatises is to help Christian adults mature in Christ and to become more like Him, as He is revealed to them in the Scriptures. A Ph. D. Professor from another well-respected seminary recently described Allen as “sharp as a tack” after proofing one of his treatises. He went on to say, “Clearly, 23 brain surgeries have not affected this man’s thinking or writing ability.” Mr. Boyle’s testimony and other writing may be seen on his Website at: mybiblestudies.us. In 1992, Allen Boyle, a successful businessman, was hit by sudden, searing pain in his head, sending him to the emergency room. Eventually he was diagnosed with a cyst in the brain, a condition that would have a tremendous impact on his future, both physically and spiritually. After 23 surgeries, Allen has learned much about pain. But he has also gained some valuable insights into the benefits of pain and loss—-that there is hope and purpose behind suffering. He has discovered the secret to coping with pain both mental and physical and he shares his findings in a way that all readers can relate to. His hope is to encourage and give comfort to others, even as God has encouraged and comforted him. 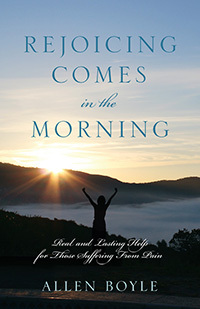 …REJOICING Comes in the Morning is a powerfully moving testament of courage, faith, and hope.